National Health Mission Meghalaya Recruitment 2019 January :- Hey Everyone. Welcome to NeCareer. We are back with a new northeast employment news in January 2019. Earlier , Meghalaya government has issued an NHM recruitment in december 2018. Today, National Healath Mission has published a new job notification. 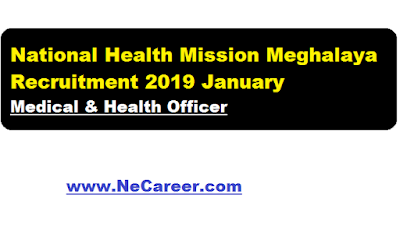 Job details : -According to the latest NHM Meghalaya Recruitment 2019 , applications are invited for NHM Meghalaya for the implementation of National Health Mission (NHM), District Health Society, West Jaintia Hills, Jowai is calling for a walk in interview from Interested and eligible candidates who are citizens of India, on the 25th January 2019 at 11:00 AM, in the Office Chamber of the Deputy Commissioner, West Jaintia Hills, Jowai. The vacant post is under the National Urban Health Mission and is purely on contractual basis. Place of posting:- The District Medical & Health Office, West Jaintia Hills, Jowai. Upper age limit:-Not exceeding 65 years. Salary:- Rs. 40,275/- per month (fixed). Essential Qualification:- Candidates must have done MBBS from a recognized University/ College and duly registered with the Medical Council of India. Interested and eligible candidates are advised to bring all the relevant documents In original on the date of the walk-in Interview. Preferences will be given to candidates residing within the District. Date & Time:- 25th January 2019 from 11:00 AM.